June 6 - Saint Norbert, Bishop - Optional Memorial - My Catholic Life! Today’s saint was born into an elite family in central Europe with connections to imperial families and the nobility of his time. He received an excellent education in keeping with his high status and received tonsure, the particular cutting of the hair on the scalp denoting one as a cleric. He was then appointed a canon, a member of a bishop’s inner circle of advisers who prayed the liturgical hours in common with other canons. St. Norbert was well on his way to a career as an ecclesiastic typical of his era: well connected, intelligent, politically aware, committed to the Church, an adviser to princes and bishops, and living a comfortable life largely indistinguishable from those of the laymen whose company he mostly kept. Norbert avoided priestly ordination and turned down a chance to become a bishop. In a one Church world where civil power and church power were intertwined, canons lived comfortably and held a quasi-civil office which dispensed prayers, graces, and spiritual favors which the populace paid handsomely for. If not for a near-death experience when he was thirty five years old, St. Norbert would be known as just Norbert, and would be resting, forgotten, under the floor of a German cathedral. One day in 1115, he was riding his horse when a lightning bolt struck nearby. His animal threw him hard to the ground. He was unconscious for a long time, but survived. It was jarring, both physically and spiritually. He was changed. He was penitent. He would abandon his life of frivolity. He would take his religious commitment seriously. This powerful experience of the fleetingness of life and its pleasures compelled Norbert to leave the wide, crowded road he was traveling to walk, instead, a narrower, stonier, less traveled path. And as Norbert walked, he shedded his past step by step, until over many years Saint Norbert emerged, miter on his head, bishop’s crozier in one hand, and a monstrance in the other. One moment changed his life. It ceased to be just a moment, in fact, but was converted into a permanent event. God broke through, touched his deepest core, and created a new man. Soon after this near-death experience, Norbert was ordained a priest, went on a month long retreat, founded a monastery with his own wealth, and began to preach about the transitory nature of the world. He had the fervor of a convert, the ardor of one for whom all things were new. Life was a permanent Spring day. He sold all that he had except what was necessary to say Mass, divested himself of all his properties, and gave everything to the poor. He wore a simple habit, went barefoot, and begged for food. He started to preach throughout France and Germany and became well known. At the instigation of the Pope, he founded a religious Order, which quickly expanded. He was so well respected in Germany that, despite being the founder of an Order, he was named bishop of a large see. Saint Norbert became involved in various ecclesiastical arguments of his day of both a political and theological nature. St. Norbert’s efforts to reform the clergy of his day were not always well received. He was spat upon and rejected. But he persevered. No one outdid him in devotion to the Holy Eucharist, which he preached about constantly. He is most often depicted as a bishop holding either a monstrance or a ciborium, both of which hold the Holy Eucharist. The Norbertine Order continues to thrive, nine hundred years after it was founded. Would that anyone would speak just our name nine hundred years after we die! The Church remembers her saints, preserves their memories, and ensures that the heroes of our faith are held up for emulation long after they have done their work. St. Norbert, your conversion led to your life of total dedication to Christ and the Church. This change was nourished by reception of and devotion to the Holy Eucharist. May we be continually nourished with and converted by the same food from heaven. OF noble rank and rare talents, Norbert passed a most pious youth, and entered the ecclesiastical state. By a strange contradiction, his conduct now became a scandal to his sacred calling, and at the court of the Emperor Henry IV. he led, like many clerics of that age, a life of dissipation and luxury. One day, when he was thirty years of age, he was thrown half dead from his horse, and on recovering his senses, resolved upon a new life. After a severe and searching preparation, he was ordained priest, and began to expose the abuses of his Order. Silenced at first by a local council, he obtained the Pope’s sanction and preached penance to listening crowds in France and the Netherlands. In the wild vale of Prémontré he gave to some trained disciples the rule of St. Austin, and a white habit to denote the angelic purity proper to the priesthood. The Canons Regular, or Premonstratensians, as they were called, were to unite the active work of the country clergy with the obligations of the monastic life. Their fervor renewed the spirit of the priesthood, quickened the faith of the people, and drove out heresy. A vile heretic, named Tankelin, appeared at Antwerp, in the time of St. Norbert, and denied the reality of the priesthood, and especially blasphemed the Blessed Eucharist. The Saint was sent for to drive out the pest. By his burning words he exposed the impostor and rekindled the faith in the Blessed Sacrament. Many of the apostates had proved their contempt for the Blessed Sacrament by burying it in filthy places. Norbert bade them search for the Sacred Hosts. They found them entire and uninjured, and the Saint bore them back in triumph to the tabernacle. Hence he is generally painted with the monstrance in his hand. In 1126 Norbert found himself appointed Bishop of Magdeburg; and there, at the risk of his life, he zealously carried on his work of reform, and died, worn out with toil, at the age of fifty-three. 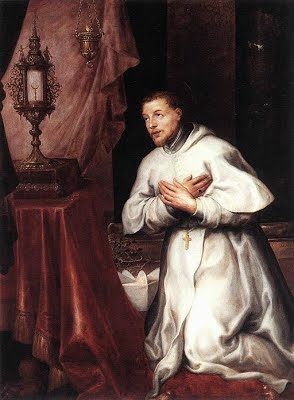 Reflection.—Reparation for the injuries offered to the Blessed Sacrament was the aim of St. Norbert’s great work of reform—in himself, in the clergy, and in the faithful. How much does our present worship repair for our own past irreverences, and for the outrages offered by others to the Blessed Eucharist.